Today's custom wallpaper image inspiration is x-rays. If you've been unfortunate enough to experience a broken bone, you know the look of an x-ray intimately. There's a certain mystique about the look of an x-ray; be it the ghostly, slightly macabre appearance or the soft, almost ethereal coloring, an x-ray image can be perfect image source for a custom wallpaper installation. Consider the inspiration room above: the subtle blues and grays of the wall mural allow the punchy, acidic green of the bench to stand out. The open hand in the wall mural, though slightly eerie, still has a welcoming quality. Almost as if to say, "Have a seat, won't you?" Clearly this custom wall mural would be right at home at a radiology department in a hospital. But if you can overcome the obvious and find a wall in your home that would work with an x-ray image, the effect would be quite striking. As always with our custom wallpaper, your x-ray image may be tweaked to your liking; the color could shifted to a warmer tone for a more neutral living space, or the image could be repeated to form a unique pattern. Why not immortalize a previous injury? 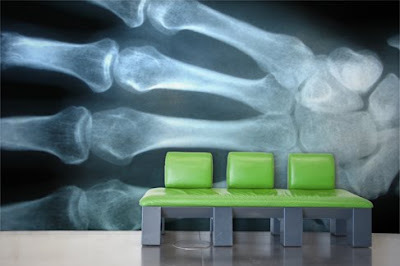 Send us an x-ray of your bones, which we would scan to create your very own one-of-a-kind wall mural. Can anyone tell me where I can by this green couch?